Some things in life simply defy the laws of common sense: Bottled water (why are we paying for something that is supposed to be free? ), Ugg boots with shorts, Justin Bieber’s entire existence… But Kim Kardashian West, as she is wont to do, has taken the nonsensical to an entirely new level. Marie Claire published an interview with the reality star this morning, in which she dishes on everything from growing up Kardashian to being a mom. New moms make all kinds of mistakes with their first child, but none so silly as letting a toddler near their very expensive grown-up stuff. Money is clearly no object for Kim Kardashian, who is reportedly worth about $45 million. Which is probably the reason why the bag she uses to carry daughter North’s diapers and other baby effects is…a Birkin bag. You read that right. North West’s nappies get carried around in a bag that’s worth at least $10,000. Um yeah, obviously not because she’s a BABY. 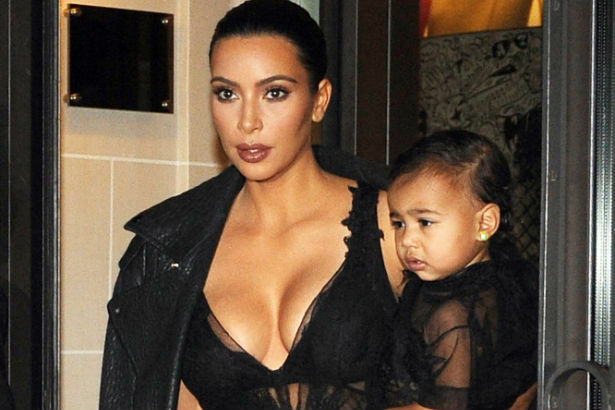 We get that Kim’s a first-time mom, but come on, kids are messy. They spill, they drool, they poop, they put their fingers in all kinds of dirty places, because that’s what they’re supposed to do. It seems a little ridiculous to have such an expensive item as your go-to for something that can get as dirty as a diaper bag. But hey, in Kim’s world, Birkins probably grow on trees.